If there's one thing that Il Clandestino is, it's clandestine. That is definitely the word. To get to this tiny restaurant, you turn off the A14, the coastal highway that runs down Italy from thigh to heel, like the seam on a silk stocking, and plunge through the cool, green forests of Monte Conero until you reach the hamlet of Portonovo. Here, where the mountains of Marche crash into the sea, a narrow strip of land provides space for a few restaurants, a beach or two and a petrol station that sells ice cream. Just south of here you must proceed on foot, on a forked path that winds through a mass of oleanders, ever onwards towards the sea. There is no signpost to tell you to take the right fork, but do so anyway, and it will finally lead to a small but perfectly formed hidden beach: a curve of gleaming white pebbles smiling into the waves. 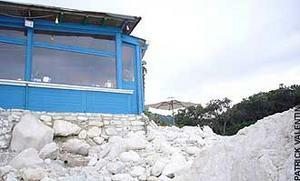 The sole building on the sloping beach is Il Clandestino, a simple, blue structure, open on two sides. The only exterior decoration is a single string of coloured light bulbs facing the clear, bright Adriatic Sea. Some tables spill down over the pebbles, where smiling waitresses with cappuccino tans and white linen uniforms deliver chilled cocktails of vodka, Prosecco, ginger beer and assorted aperitivi to their sun-kissed clientele. It's like stumbling on a glamorous film set after a parched jungle odyssey. A rippling, muscular young man climbs out of the sea, combs his long hair at the water's edge and changes into a pair of… "Jan!" "What?" "Are you just going to stand there with your mouth open, or are we going to have dinner?" barks S.
Being with him in Italy is like being chained to a dim but frisky gun dog while I'm trying my best to dolce the vita at every opportunity. There is nothing for it but to follow him across the pebbles to a table overlooking the sea, where a waitress brings bread in a waxed paper bag, stamped with the restaurant's name, and peculiar cutlery with long, slim handles, like surgical instruments. For Il Clandestino is no ordinary beachside restaurant. 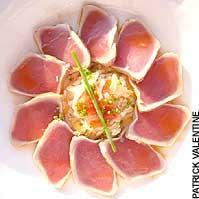 The speciality of the house is sushi - or susci, as the chef insists - which is prepared in a uniquely Italian way. Instead of soy, wasabi and seaweed, the dishes are seasoned with olive oil, balsamic vinegar, herbs, tomato and even burrata, a kind of pillowy mozzarella. The rice used is the vialone nano variety, a risotto rice that is usually grown in the Po valley, but is also dry-cultivated here in Marche, then primed with vinegar, sugar and salt for Clandestino's susci. It may sound strange, it may not work everywhere but here, amid the pine-scented breeze and salty air, along a bountiful coastline that produces 10 per cent of Italy's seafood catch, it works absolutely brilliantly. We have a plate of tuna tataki, the fanned slices of dusky pink fish seared around the edge and briefly marinated in oil, garlic, chilli, onion and a brisk drop of anchovy brine; not enough to overwhelm, just to gently make the point. Some shelled clams, a tangle of cuttlefish and the delicious local mussels are all lightly cooked, for just a few seconds, then mixed with rice and a sharp parsley and lemon dressing, and served in glass mugs - a delicious, portable picnic. Raw scallops shivering under a fresh lime dressing are followed by small "pizzas" (actually toasted brioche) topped with mackerel and burrata, then a delicate, clean-tasting dish of crab, squid and sweet tomatoes dressed with olive oil and soft herbs. The initial shock is not just that everything is so fresh and beautifully prepared, but that these flawless dishes are sailing out of what is basically a shack on the beach with a rattan roof. Yet to understand Il Clandestino, you have to know that it is the baby sister of La Madonnina del Pescatore, one of Italy's most celebrated restaurants, which is about 20 miles north of here, in the coastal town of Senegallia. There, chef Moreno Cedroni presides over a grand, expensive menu in his glamorous culinary epicentre; here he just kicks back on the beach like everyone else. Sushi is nothing new in Italy, but Cedroni's take on it has been constantly evolving since he opened Clandestino six years ago. Down in the shack they also sell the chef's home-canned preparations - cans of cuttlefish and green peas for example, or octopus, potatoes and cuttlefish eggs, or maybe just some sardines in chilli oil - which you crack open at your table and enjoy with bread and a bottle of something from the expansive wine list. It's genius, really. "Do you want to play a game?" our young waiter asks. I lower my eyelashes and nod, in my ever-hopeful way. It's disappointing when he returns with a map - I could have done with one earlier, mate - and places it in front of me like a table mat. "This is your map of tuna," he says, and disappears to fetch the first of the four tuna preparations that I have to follow around the… map? Yes, you're right. I haven't a clue what's going on, I'm just going with the fishy flow. Il gioco del tonna begins with some irreproachable raw yellowfin tuna, followed by slices of tuna that have been cured like bresaola, followed by tuna cubes dressed with a vinaigrette containing wild fennel, rosemary and garlic - the aromatics usually used to cook porchetta - and then tuna braised in the manner of beef and topped with, yes, a tuna sauce. Fabulous, even if I now know exactly what a greedy shark feels like after a successful raid on the tuna shoal. Out on the bay, the evening light is spectacular as the turquoise sea shimmers and the sky turns deep pink. Music softly plays as the Clandestino atmosphere continues to be relaxed and laid back. Come here for dinner and I promise you'll never forget it. Tonight, there is the murmur of happy conversation, the occasional laugh and that bittersweet moment far from home when you begin to think lots of things about yourself: maybe you wish that you lived here, maybe that the day will come when you, too, can swim in a warm sea every evening. But mostly you might just be praying that you don't see another tuna for a long, long time. Il Clandestino, Baia di Portonovo, Ancona, Italy (telephone and fax: 0039 071 801 422). Closed Tuesdays. Opens from April to October. Snacks at breakfast and lunch, sushi served from 5pm onwards. Christmas openings, please call to check. Dinner for two, excluding drinks and service, £60.